“It’s an embedded system if the end-user doesn’t control the code that it runs”. Once an end user takes control of the code it changes from being an appliance and becomes a general purpose computer. This entry was posted in Uncategorised on 2017-04-20 by Martin. I was reading bunnie’s recent post on the manufacturing techniques used in USB flash-drives… bare die manipulated by hand with a stick! Today I found an old (128MB!) SD card from my Palm Tungsten-T. Circa 2005 if I remember rightly. Very different technology, actual chips soldered down on the board. 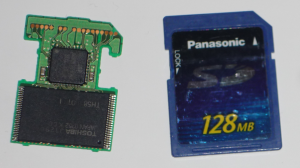 And it’s clear that the SD card form factor was very much defined by the physical size of the NAND flash chips available at the time! This entry was posted in Uncategorised on 2013-05-04 by Martin. For want of a better place to log how to get at the dishwasher pump next time it gets stuck with a tiny piece of plastic blocking the impeller, I’m sticking it here. * Don’t lose the bit of polystyrene from the anti-flooding switch! * remove tiny piece of debris of some sort. * Put it all back together again. This entry was posted in Uncategorised on 2011-10-05 by Martin. It’s sponsored by Digikey, much like RS‘s DesignSpark and Farnell‘s element14. There’s an awful lot of content and I’ve barely scratched through a tiny bit of it – worth a trawl! If you’re visiting from EEWeb, you might be interested in my FPGA or VHDL related writings, or my solderless Drawdio – or maybe something else! This entry was posted in Uncategorised on 2011-09-06 by Martin. variables which are local to a process. This can cause some interesting effects on coding style – take for example this question on StackOverflow. A code example is provided there which shows what has to happen due to the update semantics of signals – deeply nested ifs. This entry was posted in Uncategorised on 2011-05-25 by Martin. And so, finally, after all that setup, some code to read PGM files and how to make use of it. Next stage will be writing some files! This entry was posted in Uncategorised on 2011-01-18 by Martin. libv – assert_equal, str, etc. report prefix & " wrong. Got " & integer'image(got) & " expected "
& "(difference=" & integer'image(got-expected) &")"
& "(difference=" & integer'image(got'length-expected'length) &")"
report prefix & " got(" & integer'image(got'low+i) & ") = "
report "Can't fit " & integer'image(val) & " into "
& integer'image(length) & " character(s) - returning full width"
This entry was posted in Uncategorised on 2011-01-16 by Martin. It’s been very kindly pointed out to me via email (by Tricky) that I was talking complete rubbish saying that VHDL is rubbish at 2d arrays. What I should’ve said was “VHDL is rubbish at arrays of other arrays”, which is a subtle but critical difference! Arrays of other arrays are very useful (for example in register files), and the fact that the dimensions of one of the arrays must be known at compile time can make some things tricky to impossible. For example, a generic mux with a variable number of inputs can’t easily also have a generic number of bits on each input. This has no bearing at all on the reading, storage and writing of images! The reason I wrote what I did stems back (I think!) to the fact that I first wrote an image reading library many years ago at work and it’s worked in a similar way ever since, Now the code I published the other day is completely new, written straight out of my head, but with my “ancient” prejudices attached to it. When Tricky wrote to me saying what’s wrong with proper 2d arrays, the light bulb pinged and I spent several hours wandering the house kicking myself! Still, it’s good to learn new things, even if you thought you already knew about them – clearly I hadn’t got them ingrained enough! So, I’ve created a new version of the page in question, which creates a much tidier image access library. Next up in the image processing series – reading image files in VHDL. This allows our testbenches to operate on real image data. After this we can create a camera model which will produce the pixels and synchronisation signals like a real camera so that we can do complete image tests of a processing pipeline. This entry was posted in Uncategorised on 2011-01-11 by Martin. Please note that this page talks rubbish – here’s why, and here’s a better version. If we’re going to do some image processing in VHDL, we’re going to need to be able to read images in to our simulations. VHDL’s file handling is pretty poor to say the least, so we’ll keep things simple by only handling a very simple file format – namely Portable Greymap (PGM). And for even more simplicity we’ll handle on one variant with 8-bit pixels (P2 format with Maxval<256). We’ve got a subtype for the raw pixel type – this enables us to change a single place if we decide to extend to (say) 16-bit pixels. For the input side, a simple testbench is all that is required, along with a carefully crafted PGM file for which we “know the right answers”. Following that, we can change one or more pixels with the set_pixel() interface, check that it has been done correctly, and write the new image out. Checking that final image will have to be done by hand. We could “round-trip” the image back in through our image reading function, but this may mask any errors we’ve made in the reading and writing functions which happen to cancel each other out! The constant testdata is what we will “draw” into our image with a paint package in order to create the input image for testing. The assert_equal functions are part of my library of useful things (maybe this could be a start towards VHDL’s jQuery :) libv. Why not just use assert as is? Well, it’s useful to report all assert results in the same fashion, particularly to include the values that you expected and what you tested, along with the difference between them – often this is useful debugging information. report prefix & " wrong. Got " & integer’image(got) & " expected " & integer’image(expected) & "(difference=" & integer’image(got-expected) &")"
& "(difference=" & integer’image(got’length-expected’length) &")"
In the spirit of Test-Driven Development, all the API elements are left empty, except for the pgm_read function which has to return something. I’ve created a “constant” empty_image for it to return (except it has to be a variable as it has an access type in it). Hurrah! It fails in the way we’d hope! This entry was posted in Uncategorised on 2011-01-05 by Martin.